FACEBOOK chat with Katrina Wynne, M.A. conducted at 10:51pm, Sep 22, 2009. Facebook.com is a global social networking website. Where are you Katrina, what part of the world do you live in? As a self-proclaimed “forest mystic” I am sitting in my little home in the Oregon Coast forest outside of Yachats…pronounced Ya-hots…this is a local native name, like many of the names in Oregon and Washington. The Yachats River runs through my land, with salmon spawning right in front of my home. What does it mean to be a Forest Mystic? My heart is of the land. My mind and heart are reflected in the many mystical traditions, especially focused on the visual medium of Tarot cards and their unique form of translating universal wisdom. How did you get introduced to Tarot cards? Initially they were a hand-me-down gift from a friend. I was not ready, but they flirted with my attention for a few years until I began to find a few books on Tarot, such as Mary Greer’s “Tarot for Your Self” and “Maps of Consciousness” by Ralph Metzner. Our relationship grew in a very personal way. As I learned more about life and spirit, I noticed that my friend, Tarot, was well versed in such topics. That’s when I became very focused on Tarot wisdom and began to collect every book I could find on the subject. I have found some incredible old books. What other ways did you learn about Tarot? To be truthful, I’m mostly a self taught Tarot person. The next part of my journey was to find the best deck that reflected my values. I went from the Marseille, to Waite/Smith, to Motherpeace, to Medicine Cards, and finally to Voyager, which has been my home since they were first printed. For me they have a more universal appeal, rather than limited to human-centric symbols. Then, my personal journaling with the Voyager took me to a deeper place. On your deeper journey, what have you found? I found what I can proclaim is the main reason for the development of Tarot cards…a deeper, more intuitive relationship with myself, life, spirit, etc. Has this translated into your personal work? Yes … that is the ironic and completely intuitive/spiritual calling of my life. Spirit/Divine sent me to this land, which was counter intuitive considering that I had just finished graduate school with a Masters in Counseling Psychology and ready to set up a big, successful practice. But here I landed, in the middle of nowhere with a calling to steward this forest. Then, my new neighbors found out about my knowledge of Tarot, which had been a solitary practice, and asked me to start teaching classes. Long story…18 years later, I naturally combined the ethics and awareness skills of my psychotherapy training (Arnold Mindell-Process Work) and developed what I titled “Transformative Tarot Counseling™ / Transformative Tarot Consulting™“. So, your neighbors didn’t ask you to leave town! Not all the neighbors, HaHa. Some are afraid of me, but we all get along and look out for each other. For 20 years you’ve had a professional practice as a counselor … do you use Tarot in your counseling work? Where can folks find out about your services? For clarification, I usually do not mix the Tarot with my counseling, unless that is the expressed interest of the client. I offer phone sessions, am developing a webinar for my worldwide students, and rewriting “My Tarot Journey”, the book I wrote to help students to create their own journey of learning with the Tarot, and I just updated my Tarot History poster. Like you, I’m a Tarot enthusiast. Thank you for the clarification. I imagine there are ways to overlap your knowledge of Tarot and of psychotherapy. Also, I’d like to hear more about your life with trees. Yes, I use counseling skills and awareness when working with Tarot clients, but am very aware of honoring boundaries and being careful of how deeply we go. My intuition may invite me to go further, but I will only offer this to the client and wait for their permission before jumping into anything that resembles counseling. This has the added benefit of raising the client’s awareness as well. The trees are very sacred to me…and to the Tarot. When designing the art for the Tarot History poster, I spent over a year writing out my notes and organizing the facts in a way that they flowed and made sense to me and my students. When it finally came together I could see the history itself was like a tree with roots, a trunk, and branches. My dear friend and neighbor, Qahira, followed my vision and added her unique artistic eye to creating the tree. Where can we find your Tarot History poster? 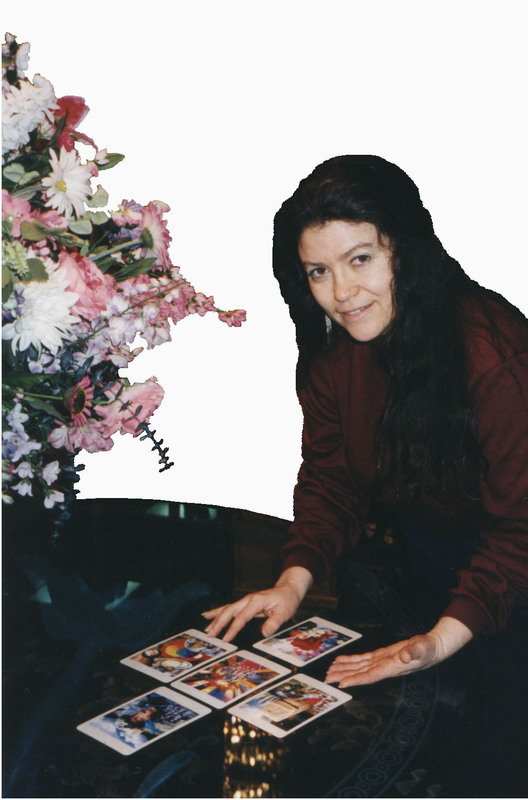 Online, the history poster can be seen and ordered from my Tarot Counseling website or from the weblog. In Portland, OR, it can be purchased at New Renaissance Bookshop, and last, I’ll be selling them at BATS in San Francisco in two weeks. Yes…I’m so excited to be attending this two-day event, seeing old Tarot friends, meeting new ones, and sharing my Tarot creation. Wish I were attending… especially since it is the Centenary of the RWS deck! Oh Nooo…you aren’t coming? I guess we will just have to keep our love of Tarot in cyberspace for now. I’m eagerly looking forward to the wisdom of Tarot queens, such as Mary Greer and Rachel Pollack, to increase my knowledge of the 100 year old Waite/Smith deck. Holly Voley will also be there with her wealth of Rider/Waite/Smith deck knowledge. We have opened the chat to other friends and are expecting to hear from Alan. Alan is a facebook friend who has similar perspectives to mine. That is the groovy thing about facebook and the reason I joined, coming out of my forest closet, to meet new folks like you and exchange ideas and wisdom. Hi Alan, glad you can join us. Do you have a questions or comment for us? I guess one major question is do you have to follow the guide to what a card means or can you just read the image and make from it what you will when reading for yourself? I’m using the Thoth pack and I see much more and feel more reading into the artwork rather than what is suggested as the meaning of the card. Alan – I’m glad you asked that question. The intuitive way of reading a card is to relate to the imagery, or whatever comes through you when relating to that card. If working with a client, I would first add the client’s impression, then mine, and end with knowledge of the card to blend them all together. I‘m asking as I have trouble remember the cards .. well not the major ones. Is there a technique to this you feel is best or a book or a video you can recommend? Alan – Here is what I recommend for learning the cards. I would pick a favorite deck, such as the one you mentioned, Thoth. Then, commit to at least a 6-month journaling process. Separate the major arcana from the minor. Use only the major for the first two months, picking randomly, and then, intentionally, if certain cards have not appeared. Once you feel confident about the majors, add the minor and continue the same process. In the next post I will describe how to journal each day. Please hold on for my next post. Thanks. Alan – part two – How to journal on a Tarot card. Each day you pick one card, in whatever style you like. Imagine this is your daily message from the Tarot. As you turn the card over to look at it, notice your first, intuitive, impression. It could be a thought, feeling, association, etc. Please make note of this in your journal. You can also draw a picture of the card, or an impression from the card, etc. The next step is to look into a favorite book on your deck and write what the book says related to your personal impression. Last, at the end of your day, make a note about how the lesson or message of this card showed up in your day. Thank you so much for your presence and questions. Dream well! Thank you Katrina. I agree a journal is way important. Being English I love gardening and can’t wait to read about that as well I find it spiritually satisfying and a form of mediation. I look forward to reading all your post and thank you for asking me to post. I agree with Katrina, Alan, and thank you for your visit with us tonight. I think this is a good place to close. You’ve offered some excellent new resources and tips as a Tarot professional with years in the work. Any last thoughts? My last thought and feeling is of appreciation for your dedication to the art and magic of Tarot, your reaching out to folks, and your excellent people skills. I sincerely thank you for this unique opportunity to share with you, and the world, perhaps. It has been a real treat. Thank YOU Katrina, for your kind words. The great motivator is our love of Tarot.